Legumes growing together with soil bacteria called rhizobia work together to take atmospheric nitrogen (N2) found in soil air spaces and transform—or fix—it into a plant-available form through the process called Biological Nitrogen Fixation (BNF) (Fig. 1). Even though the atmosphere is almost 80% N, the N2 gas is such that plants can't use it for their own growth and development unless it is fixed. However, neither legumes nor the rhizobia can do the job alone. The process must occur as part of a mutually beneficial—or symbiotic—relationship with soil-dwelling rhizobia bacteria. Rhizobia form root nodules on the host legume, thereby providing the plant with transformed N in exchange for a portion of the carbohydrates made by the plant. Figure 1. 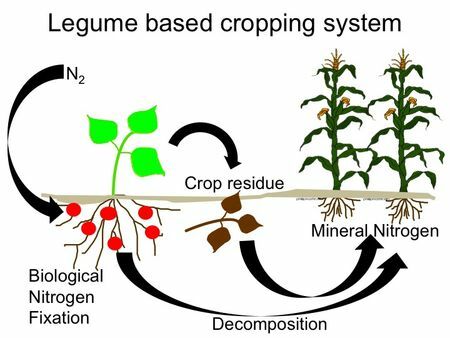 Biological Nitrogen Fixation provides nitrogen fertility in legume-based cropping systems. Figure credit: Nape Mothapo, North Carolina State University. In order for BNF to occur, certain things need to happen. First, because there are many types of rhizobia, the right type of rhizobia to form nodules with your particular legume must be in contact with the growing legume root. Additionally, the rhizobia must be efficient in fixing atmospheric N, and, of course, they must be alive! The application of the recommended type of bacteria to the seed or soil prior to planting is called inoculation. With so much to take into account to produce a strong healthy legume–rhizobia relationship, successful inoculation can seem daunting. This document will introduce you to legume inoculation and recommend proper inoculation methods for certified organic growers. Readers can view related articles for additional information on general soil fertility in organic farming systems and soil microbial nitrogen cycling in organic farming systems. Two ways to help provide your grain, forage, or cover crop legume with the N it needs for growth and development are: (1) make sure your legumes are well nodulated, and (2) verify that nodules contain effective rhizobia. The presence of nodules alone does not ensure that N is being actively fixed. Some rhizobia are ineffective, meaning that they can form nodules, but do not fix nitrogen. To check for effective rhizobia and nitrogen fixation in the field, dig out several plants and wash root systems in water to remove soil. Then select 2–3 nodules from each plant and slice them in half. Nodules that have pink or red interiors indicate that the rhizobia are hard at work fixing nitrogen, while greenish or white interiors contain ineffective rhizobia. Inoculation of your seeds prior to planting is one proven way to have the correct type of bacteria present within the vicinity of the legume's growing root. When is it Necessary to Inoculate? Figure 2. Well-formed nodules on the root system of a vetch plant. Photo credit: Julie Grossman, North Carolina State University. Rhizobia bacteria are picky little critters and are fairly specific about which legume species they will select as a host to form nodules. It is important that you purchase the correct type of bacteria for your legume seed. Some species of rhizobia can infect more than one species of legume. For example, peas and vetch all form nodules with the rhizobia species Rhizobium leguminosarum, while true clovers are all infected by R. trifolii. The groups of legumes infected by the same rhizobia are called cross-inoculation groups (Table 1.). Sometimes the correct type of bacteria that can form nodules with the legume you are planting is already present in the field. In order to ensure that the correct type of bacteria is ready and waiting for your germinating seed in the soil, farmers commonly practice inoculation with specific groups of bacteria recommended for your legume type. Table 1. Cross-inoculation groups of legumes and rhizobia. Is Inoculation of My Legumes a Requirement for Good Growth? Inoculation is recommended when the field has no past history of growth of your particular legume, or when you have a high value crop for which you want to ensure successful growth. 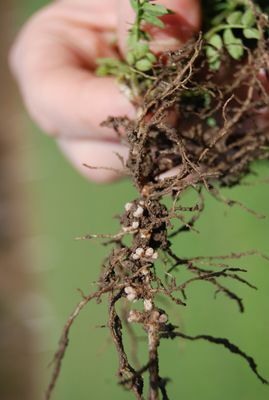 Often, inoculant rhizobia can remain viable in the soil without the presence of a legume for years, and then be ready to form nodules when its host plant is sown. Field history that includes a legume can increase the soil rhizobia population and result in improved nodulation (Mothapo et al., 2011). Specifically, inoculation is recommended if the field has been out of host plant production for 3–5 years, or never planted to the host. Further, inoculation can help increase rhizobia populations in fields with unfavorable environmental conditions for the bacteria's long-term survival, such as pH below 6.0, extremely sandy soils, or periodically-flooded conditions. Past history that includes a diversity of legume species—common in organic systems—has been shown to increase the diversity of rhizobia types present in the field (Grossman et al., 2011). How Do I Inoculate My Legumes? Take care of your inoculants—they are alive! Inoculants come in many forms, but the most common is as a bacteria-infused peat that has a black, dust-like appearance. The bacteria on the peat particles may not look like much, but they are indeed alive, and should be treated with care. Although peat has been shown to mediate unfavorable conditions such as high temperatures and long storage times, certain precautions are necessary in order to increase inoculant effectiveness. Inoculant packages come with an expiration date that should be heeded—use of an inoculant past its expiration date could mean that you are adding bacteria to your seed that are not alive or healthy. Treat the inoculant as you might treat a living organism—don’t leave it in the sun for extended periods of time, and store it in a cool dry place when not in use, such as a refrigerator. Many manufacturer recommendations offer a suggested temperature of 40°F. Inoculants can be added to the soil or directly to your seed prior to planting. In direct-soil application, granular inoculants can be added to the soil via the fertilizer box of a standard planter or drill, as long as the box has no history of substances prohibited in organic production, or the box is thoroughly cleaned prior to use. Flow of the inoculant should be calibrated in order to ensure a steady flow of material to the field. Frozen concentrated and liquid inoculant cultures are also available. In this case, the frozen cultures should be thawed and diluted according to manufacturers' directions and added to a water tank for field application in the seed row. Field application of inoculants requires more volume of inoculant to be added than seed-applied, in order to ensure the inoculant comes in contact with your legume seed. In seed-applied inoculant, a more common practice among small-scale organic producers, the bacteria is mixed with the seed prior to planting. Seed should not be mixed in a small space such as a planter box, but instead on a large surface where all of the seeds have the opportunity to come into contact with the inoculant. Suggested places for mixing your seed include the bed of your pickup truck, a tarp on the ground, or in a tub. Stickers—adhesives that can be used to ensure that the peat inoculant adheres to your seed—are commonly used to ensure good contact between the seed and bacteria. Research has shown increase in nodulation when stickers are used. Stickers can be commercially purchased or made at home using dilutions of milk or molasses (1 part sticker to 10 parts water is common). To use a sticker, mix seeds with just enough sticker to moisten the seeds, then add the inoculant to the moistened seeds. Be careful not to add too much liquid or the moisture could cause premature germination of your seeds. Air dry your seeds in the shade, then plant within 24 hours. Air drying the seeds will keep the moist seeds and inoculum from adhering to and plugging up your planter. If planting is not possible immediately after inoculation, inoculate again. Some seed comes pre-inoculated with a sticker. This type of inoculant should be treated with the same precautions as other types. How Much Inoculant Should I Use? The amount of inoculant to add to your seeds or field often depends on the length of time that has elapsed since the field was last inoculated. For new plantings, follow the inoculant manufacturer's directions on the package. Some farmers have found that after an initial inoculation event no inoculation is necessary in future years for good nodulation to occur. No general recommendation can be provided regarding survival of rhizobia in a field after a single inoculation event, as survial depends on individual field conditions such as soil type, pH, soil moisture, and rhizobia type. What are the Precautions for Organic Farming Systems? Growers should be aware of specific issues when using purchased inoculants in organic production of grains, cover-, and forage crops. Of interest to certified organic growers is the prohibition on the use of genetically modified organisms, ionizing radiation, or sewage sludge in the production of the inoculants. Some inoculants are produced using recombinant DNA technology—such inoculants cannot be used in organic production. IMPORTANT: Before using any input product in your organic farming system, make sure that the brand name product is listed in your Organic System Plan and approved by your USDA-approved certifier. Note that, although OMRI and WSDA lists are good places to identify potentially useful products, all products that you use MUST be approved by your USDA-accredited certifier. For more information on how to determine whether a product can be used on your farm, see Can I Use This Input on My Organic Farm? Grossman, J. M., M. E. Schipanski, T. Sooksanguan, and L. E. Drinkwater. 2011. Diversity of rhizobia nodulating soybean [Glycine max (Vinton)] varies under organic and conventional management. Applied Soil Ecology 50: 14–20. (Available online at: http://dx.doi.org/10.1016/j.apsoil.2011.08.003) (verified 20 April 2012). Mothapo, N., J. Grossman, and J., Maul. 2011. Hairy vetch cultivation history affects nodulation and biological nitrogen fixation across host genotypes. ASA-CSSA-SSSA International Annual Meetings, Oct 16–19, 2011, San Antonio, TX. (Available online at: http://a-c-s.confex.com/crops/2011am/webprogram/Paper66799.html) (verified 20 April 2012). Beegle, D. 2001. Soil fertility management for forage crops establishment. Agronomy Facts 31-B. Penn State, College of Agricultural Sciences, Cooperative Extension. (Available online at: http://cropsoil.psu.edu/extension/facts/agronomy-facts-31b) (verified 20 April 2012). Durst, D., and S. Bosworth. 1986. Inoculation of forage and grain legumes. Agronomy Facts 11. Penn State Department of Crop and Soil Sciences, Cooperative Extension. (Available online at: http://cropsoil.psu.edu/extension/facts/agronomy-facts-11) (verified 20 April 2012). Park, S., C. Cao, and B. B. McSpadden Gardener. 2010. Inoculants and soil amendments for organic growers. Fact Sheet SAG-17-10. The Ohio State University Extension. (Available online at: http://ohioline.osu.edu/sag-fact/pdf/0017.pdf) (verified 21 May 2012).